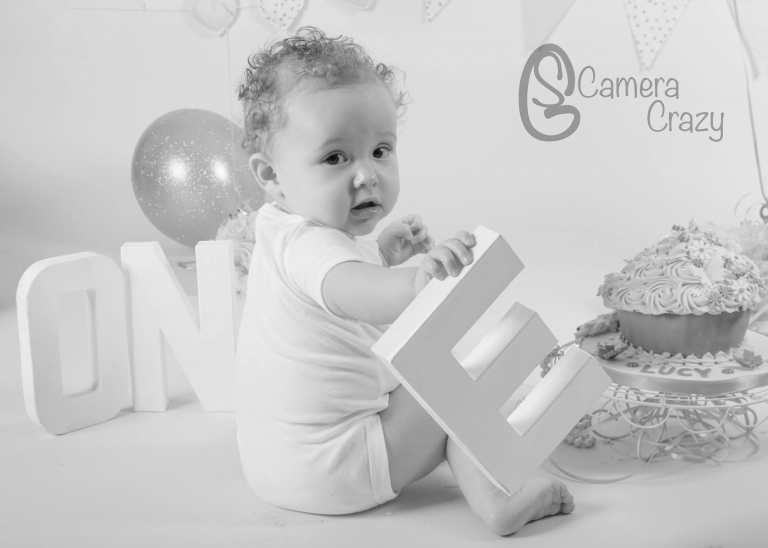 With bright icing and cake-covered fingers, faces and toes, your child’s cake smash photography session will not only leave you with beautiful images, but also wonderful memories that you can share with your child as they grow. For all cake smash photography sessions, I use of a range of high-quality props, such as bunting, balloons and wooden numbers. These are included at no further cost to add a big dollop of extra fun to your child’s images. A professionally crafted cake is included in all packages and will be provided by a local baker. For children with allergies, you are welcome to bring your own specially made cake, according to your requirements. The duration of your cake smash portrait session will vary according to your choice of package and your baby’s mood on the day. Splash time is a fun way for your baby to get clean at the end of the session. Using a specially made replica ornate bath mixed with giant rubber duck backdrop the splash session can be the perfect ending to the cake smash session. Prior to your cake smash session, you can help your child to feel at ease by allowing them to enjoy plenty of messy play activities. You could even give them a small cupcake to squash so they get used to the texture of crumbs and icing between their fingers. We want to encourage your child’s natural curiosity, so don’t rush to wipe their hands until they’ve had a chance to thoroughly explore the experience. This will ensure your child feels happy and confident when they are presented with a much larger cake during their photoshoot. our baby isn't just another baby to me; My aim is to help you create lasting memories of this monumental stage in their life. As the experience can get very messy for everyone involved, parents should wear clothes that they do not mind getting covered in sticky icing! Older siblings are welcome to join in on the session at the beginning of the session before your child begins to smash the cake. Sometimes it helps to have the older sibling join in with eating the cake during the session to ensure your baby feels at ease. Customers generally book this session for when the child is approximately 11 months old. This allows time for me to perfect your images and if you wish to create birthday cards or invitations with your images you can do so. A minimum of 3 weeks is required to order the professionally baked cake in time for each shoot. My Studio is located in Stratford East London. plenty of parking is available outside my studio and if it is unusually busy then there is a car park within 2 min walk. My studio is located within 5 min walk from Stratford High Road DLR station and under 10 min walk from Stratford Underground station. If you would like to learn more about any of my photography services, please contact me. Your baby isn’t just another baby to me; My aim is to help you create lasting memories of this monumental stage in their life. Mobile cake smash photography in Essex and London for your convenience is also an option. My mobile studio can be set up wherever it is required and I will bring along a full range of props. Alternatively, you are welcome to travel to my studio in Stratford East London for your session.